Staff Sgt. Matthew Buckner, 412th Test Wing Staff Judge Advocate’s Office, and Army veteran Joseph Antone, a member of the Veterans of Foreign Wars Post 9657, lay a wreath next to a photo of the late Sen. John McCain during a wreath-laying ceremony commemorating National POW/MIA Recognition Day at the Airman Leadership School Drill Pad at Edwards Air Force Base, Calif., Sept. 21, 2018. 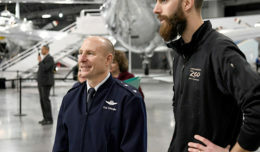 Prior to serving as a U.S. Senate member, McCain served as a Navy pilot when he was shot down over Hanoi, Vietnam, and held as a prisoner of war for more than five years. 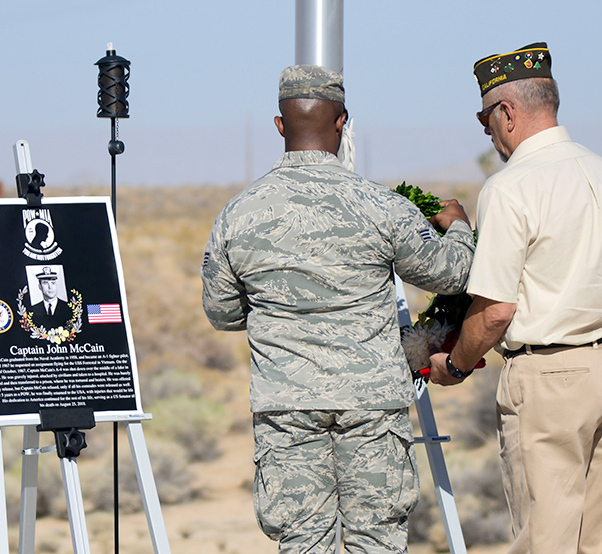 Thousands of the nation’s prisoners of war and missing in action were honored during a wreath-laying ceremony at the Airman Leadership School Drill Pad at Edwards Air Force Base, Calif., Sept. 21. 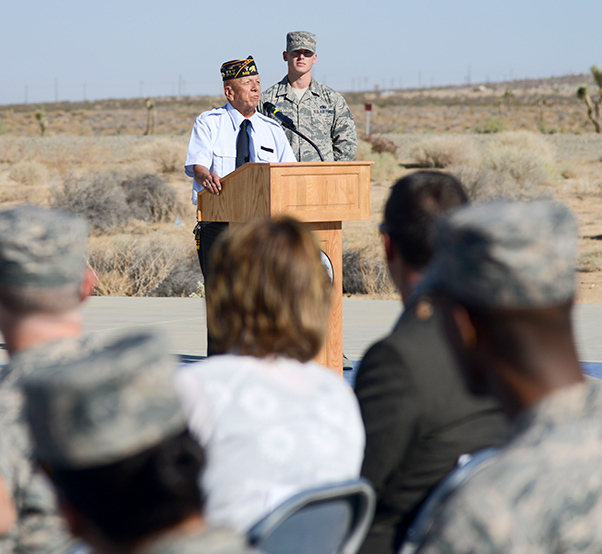 The ceremony was held on what is observed as the National POW/MIA Recognition Day. 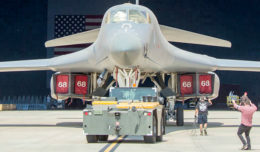 According to the Defense POW/MIA Accounting Agency, there are more than 82,000 service members still unaccounted for. Reagan was one of the guest speakers of the event. He talked about the challenge that a family member of a POW/MIA may face. He said that modern deployments may be challenging, but being a prisoner of war is unimaginable. 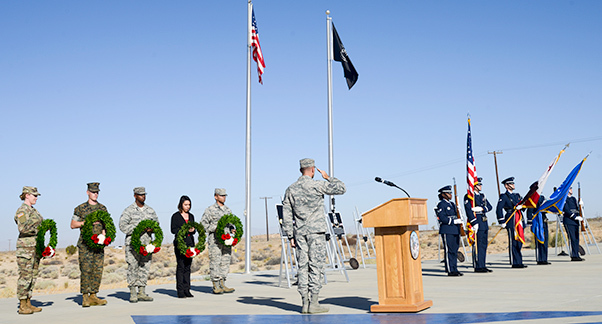 Edwards personnel render honors to the nation’s flag during a wreath-laying ceremony commemorating National POW/MIA Recognition Day at the Airman Leadership School Drill Pad at Edwards Air Force Base, Calif., Sept. 21, 2018. During the ceremony, wreaths were laid next to portraits of a handful of POW and MIA veterans. A torch was also lit to signify the nation’s commitment to find and account for those that are still missing. The observance also honors the families of POWs and MIAs who are still waiting on word about their service member. 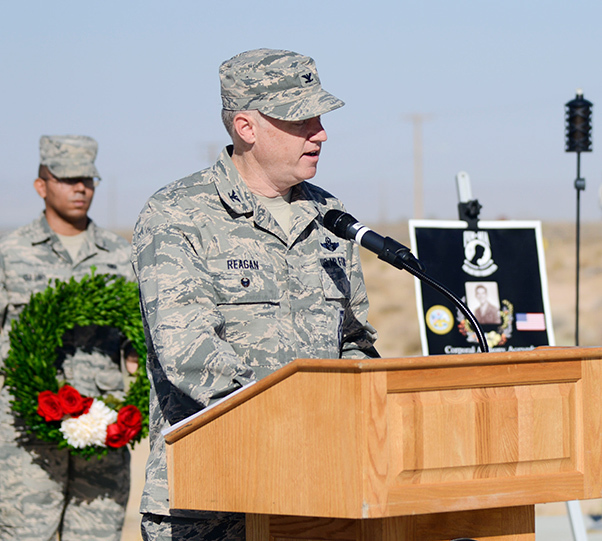 Col. Kirk Reagan, 412th Test Wing vice commander, addresses those in attendance at a wreath-laying ceremony commemorating National POW/MIA Recognition Day at the Airman Leadership School Drill Pad at Edwards Air Force Base, Calif., Sept. 21, 2018. For the families of the POWs and MIAs, waiting for news about their service members is also challenging said Carl Hernandez, commander, American Legion Post 348 of Palmdale, Calif.
Carl Hernandez, commander, American Legion Post 348 of Palmdale, Calif., gives a speech about POW/MIAs during a wreath-laying ceremony commemorating National POW/MIA Recognition Day at the Airman Leadership School Drill Pad at Edwards Air Force Base, Calif., Sept. 21, 2018. Staff Sgt. 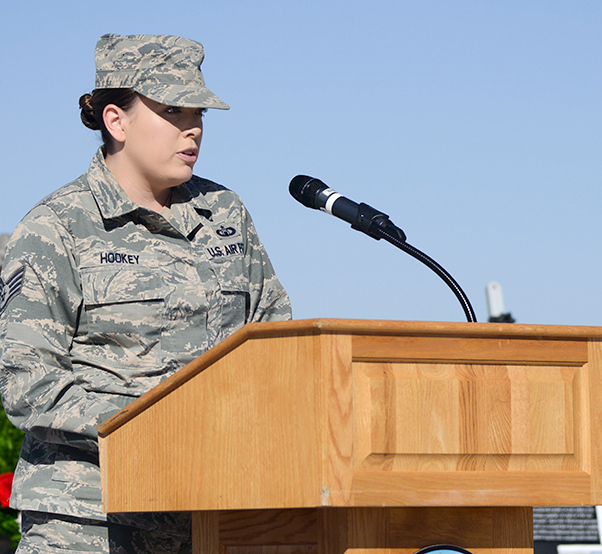 Ashley Hookey, 412th Operations Support Squadron, recounts the story of the sinking of the Japanese “Hell Ship” Junyo Maru at a wreath-laying ceremony commemorating National POW/MIA Recognition Day at the Airman Leadership School Drill Pad at Edwards Air Force Base, Calif., Sept. 21, 2018. The unmarked Junyo Maru was transporting prisoners of war when it was sunk of the coast of Sumatra on Sept. 18, 1944. Hookey’s great-grandfather was one of those killed during the sinking.